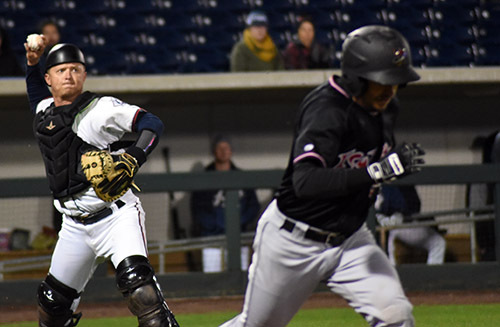 Reno Aces Kelby Tomlinson has a good eye at the plate. Kelby Tomlinson has the eyes for the game, his glasses are just a bonus. 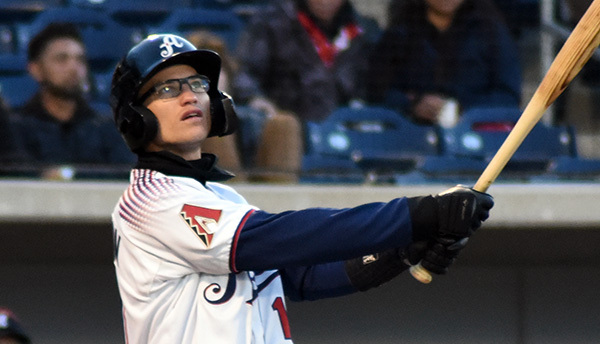 Wearing his signature black-rimmed Oakley Crosslinks, Tomlinson went 1-for-2 in the Aces’ 7-6 victory over the Albuquerque Isotopes Thursday. Reno took two of three to win their first series of the year. Tomlinson has good vision without the spectacles, but he admits he’s relied on his glasses more than ever since coming to the Biggest Little City. Tomlinson’s vision translates well to his patience at the plate. He drew a seven-pitch walk after getting down to a quick 0-2 count in the third inning. He’s drawn 58 walks in 273 career games with the San Francisco Giants and 231 for his minor league career. While Tomlinson’s glasses helps him at the plate, it’s his versatile glove that has slotted him into the starting lineup. 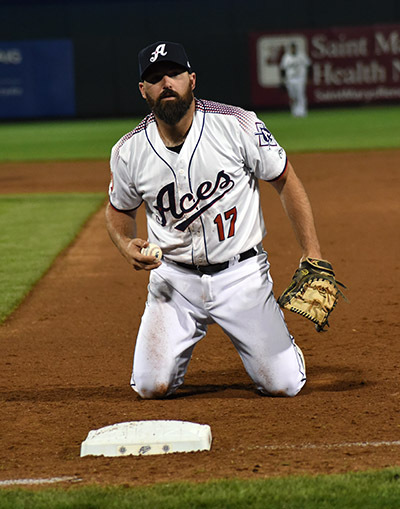 Serving as the Aces’ utility player, Tomlinson has started three games at second base, three games at shortstop and one game at third this season. No matter where he is positioned in the infield, Tomlinson isn’t afraid to get the jersey dirty stopping line drives in the gap and displaying his cat-like quickness. 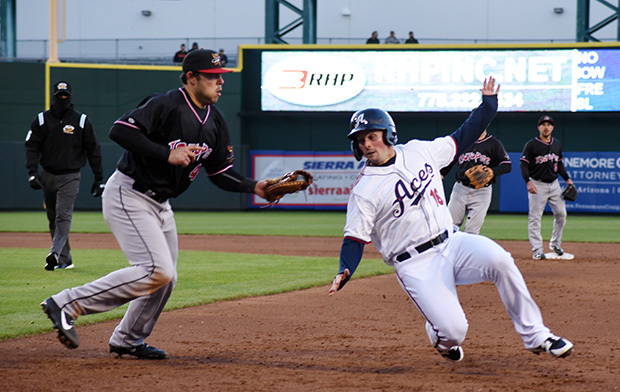 Aces’ manager Chris Cron has taken notice of Tomlinson’s defensive prowess. San Francisco selected Tomlinson in the 12th round of the 2011 MLB Draft out of Texas Tech. The rangy infielder played 97 games with the Giants’ farm system before his big-league debut in 2015. He was nicknamed “specs” by teammates and coaches. Stuck behind second baseman Joe Panik and three-time Gold Glove winning shortstop Brandon Crawford, Tomlinson split time between the Bay and Triple-A Sacramento for much of his career in the Bay Area. He signed a minor league deal with the Dbacks in the offseason, ending a four-year tenure with the Giants. Tomlinson is becoming a well-known face at Greater Nevada Field. He signed an autograph for a young fan who made the four-hour trip to see his Aces’ home debut. 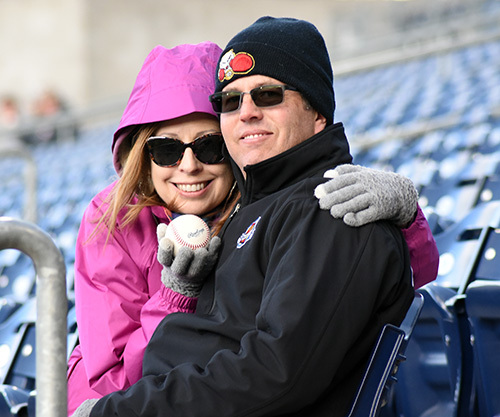 Anna and Dan Preiss snagged a foul ball in the second inning. 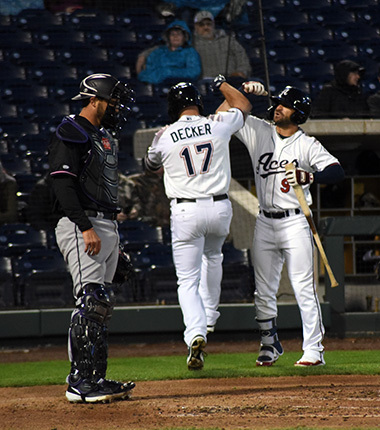 Home runs from Cody Decker and Kevin Cron propelled the Aces to the series-clinching win. Decker finished 1-for-3 with an opposite field jack that landed in the Isotopes’ bullpen. Decker’s solo shot marked his first homer of the season. He has 198 career home runs with 13 minor league teams. Cron displayed some patience during his second homer of the year. He was out in front of Jeff Hoffman’s two-seam fastball in the fifth inning. 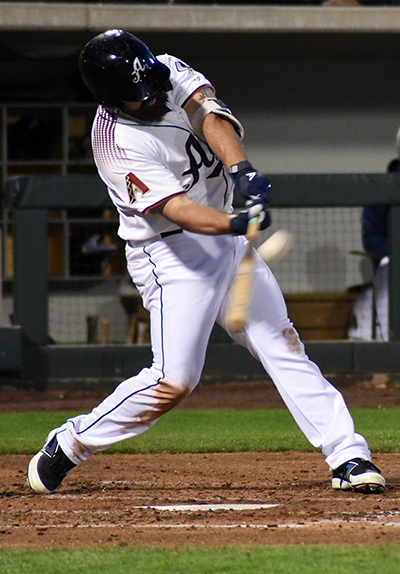 The slugging first/third baseman waited back on the heater in his next at-bat and launched a three-run blast over the Aces’ video board in the seventh. Cron finished 2-for-4 with a homer, double and a team-high four RBIs. Reno recorded eight hits. Wyatt Mathisen finished 2-for-4 with a double and RBI. Travis Snider went 2-for-4 with a pair of singles. He leads the Pacific Coast League with a .524 batting average. The veteran outfielder has appeared in 409 career minor league games. 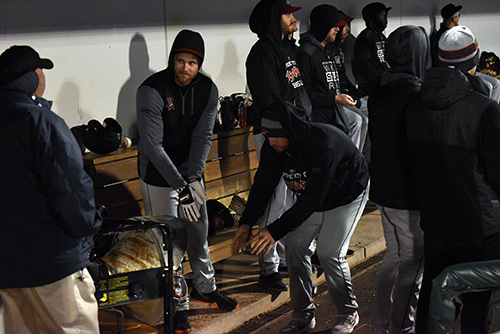 Isotopes players try to warm up in the dugout. Isotopes’ center fielder Noel Cuevas stayed hot on a cold night, going 2-for-4 with a home run, double and two RBIs. He hit for the Cycle in Albuquerque’s 13-2 win on Wednesday. 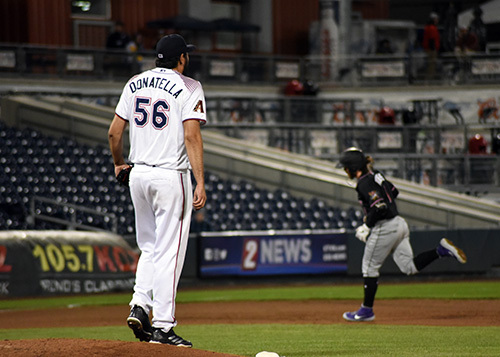 Starting pitcher Justin Donatella made his first career Triple-A start with Reno. A call-up from Double-A Jackson, the right-hander went 4.2 innings, giving up four earned runs on five hits and four strikeouts. Donatella, 24, flashed a low 90s fastball that touched the lower-half of the strike zone. But his slider caught too much of the plate, which translated to a solo home run from Colorado Rockies’ top prospect Brendan Rodgers. 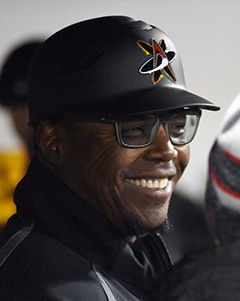 Isotopes manager Glennallen Hill flashes a “Giants” smile. Donatella had some parting words for home plate umpire Junior Valentine before heading back to the Aces’ dugout. Catcher Matt Jones also made his Triple-A debut behind the dish. Jones, 26, hit .250 with the Generals last season. He went 0-for-4 in the win. Albuquerque jumped out to a 2-0 lead in the top of the second. Donatella walked in the first run of the contest with the bases loaded. Back-to-back RBI doubles from Cron and Mathisen put the Aces up 3-2 in the third. Decker’s solo blast tacked on another run for Reno in the fourth. The Isotopes regained the lead with a two-run fifth. Cron’s three-run homer put the Aces up 7-5 with two innings left to play. Flame-throwing righty Jimmie Sherfy warmed things up in the bottom of the ninth at Greater Nevada Field. 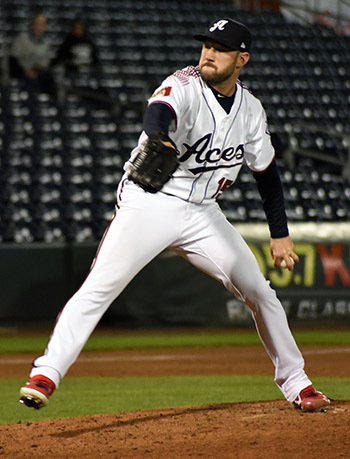 Sherfy recorded his franchise-record 49th career save with the Aces. His fastball touched 95 mph. He struck out Elliot Soto with the bases loaded to end the game. Notes: On this date in 2010 the Diamondbacks scored a franchise-record 13 runs in the fourth inning of a 15-6 victory over Pittsburgh. … The Aces are fourth in the PCL Pacific Northern Division. The Fresno Grizzlies are atop the division with a 5-2 record. … There was a paid attendance of 2,866. … The Aces recorded 13 strikeouts and four errors, the first time since April 29, 2017. … Winning pitcher Alex Young was transferred to extended spring training on Friday, opening a roster spot for right-hander Jon Duplantier, who was sent down from Arizona. 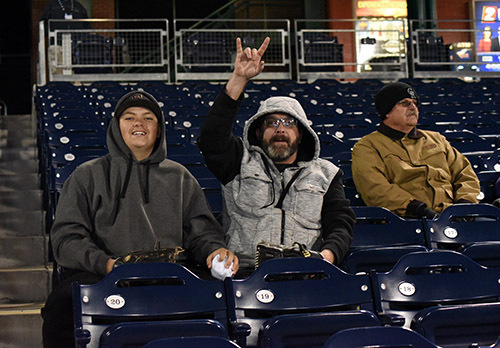 On Deck: The Aces, 3-5, continue their seven-game homestand with a four-game series against the El Paso Chihuahuas, Triple-A affiliate of the San Diego Padres. Right-handed pitcher Bryan Mitchell will get the nod for El Paso. Reno has not announced their starting pitcher for Friday. In a pickle, Travis Snider is tagged out by Albujquerque first baseman Roberto Ramos in the second inning on April 11, 2019. Snider was picked off by pitcher Antonio Senzatela, a Colorado Rockies right-hander in Triple-A on a rehab assignment. Cody Decker connects for career home run No. 198. Justin Donatella watches Brenden Rodgers round the bases after hitting a home run. Kelby Tomlinson makes contact in his first at bat. 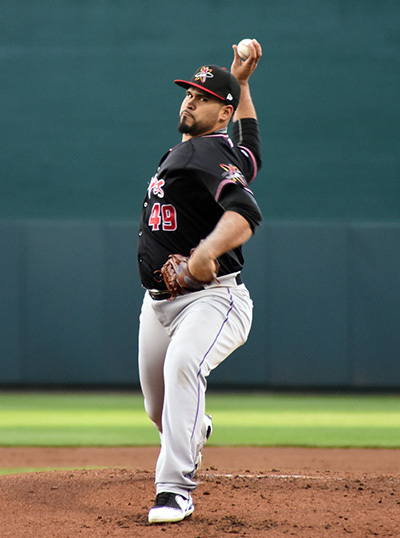 Colorado Rockies right-hander Antonio Senzatela had a rehab start for the Isotopes. Matt Jones attempts to throw out Elliot Soto, who has just struck out. First baseman Cody Decker holds the ball after a throwing error on the catcher. Winning pitcher Alex Young is set to throw a change up. So what if it’s cold Let’s play two! Tahoe Onstage sportswriter Isaiah Burrows also is a general assignment reporter for CarsonNow.org, an online news source in Carson City. He is a journalism major at the University of Nevada, Reno, where he writes sports for the Sagebrush student newspaper. He is the Reno Aces beat writer for Tahoe Onstage.